Desperado V (Huckleberry Bey++ x Daraska) and the annual Spring Fling, on April 30-May 1, 2011. Desperado V is a living legend in the Arabian world. Sired by legendary Huckleberry Bey++, Desperado has proudly carried on the incredible style and traditions that have made Varian Arabians so successful. Desperado V, foaled 2/26/1986, is tall (15.1 1/2 hands), dark and extremely handsome and he sires it! His exotic head is well known, but most of all, he has proven his ability to sire National Champions in both Halter and Performance. He carries a high set tail, beautiful eyes and emotes Arabian charisma. His disposition and trainability are transmitted to his offspring and are easily verified by contacting any trainer working with a Desperado V youngster. "Show quality" and "marketability" of Desperado V foals are well documented. Desperado V has been the leading sire on five of the AHRA stud books and he is a Sire of Significance. 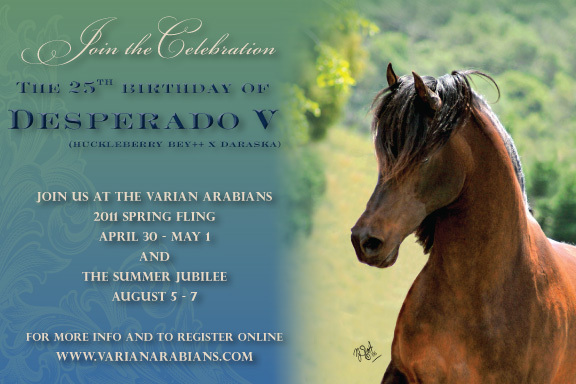 Desperado V's sire line is four generations strong of Varian breeding. All, including Desperado V himself, have been Sires of Significance. Huckleberry Bey++, Desperado V's sire, has been a leading sire for years and now his sons have taken over the leading sire spot. Desperado V's sire line brings to him both beauty and athletic ability. Most notable is his ability to "breed on" his own unique look. Desperado V's dam, Daraska, is a most exotic granddaughter of both *Bask and Comet, with a tail female line containing the legendary Mekeel mares to the aristocrat "Ghazna".